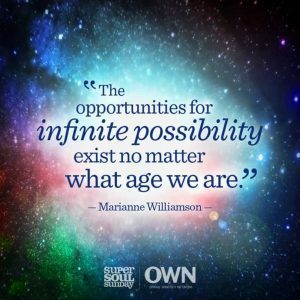 What does “Infinite Possibilities” mean to you? To me, it is the design of the Universe that God put in place. It is the limitless opportunities that are open to us. It is the choice of a thousand roads we can go down with the guarantee that we can pick another road anytime we want to. It is understanding that God not only wants us to prosper but to excel, expand, explore and live life to the fullest regardless of age, condition, circumstances or “perceived limitations”. Infinite Possibilities aren’t “pie-in-the-sky” dreams, it a storehouse you can draw from, it’s a bank account that you can write checks on, it’s a promise from God that there is always more than meets the eye or what seems to be real at the moment. Are you an adventurer? Are you a daring soul that is willing to believe life still has more to offer? Can you dream so big that it even seems a little scary? That’s a glimpse of what “Infinite Possibilities” is all about. One thing I know is this, God created us for greatness, to enjoy bliss, to discover the wonders of the Universe that He designed all for….US!!! So why not at least try to see God’s “Infinite Possibilities”.